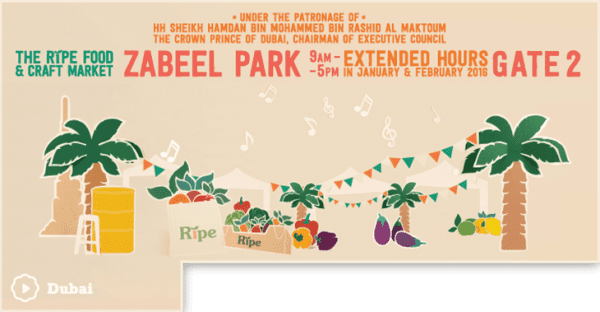 Under the Patronage of the Dubai Crown Prince, HH Sheikh Hamdan Bin Mohammed Bin Rashid Al Maktoum, The Ripe Food & Craft Market will take place every Friday at Zabeel Park, Gate 2. We will be extending our shopping hours at The Ripe Food and Craft Market taking place in Zabeel Park during the month of January and February 2016. Taking place every Friday, our hours will be from 9am until 5pm, starting from the 8th January. You can expect the welcomed by over 100 of Dubai’s talented local businesses and artisans with a wide selection of foodies, fashion designers, arts and crafts, live musicians, kiddie’s activities and so much more. Make your Friday afternoon last a little longer by meandering under the lush green palm trees, picking up some delicious locally made treats, and enjoy the cooler months with family and friends in the lush surroundings of Zabeel Park. Ripe Organic will be offering a variety of freshly harvested organic fruit and veggies from local organic certified farms, like Ripe’s famous cherry tomatoes, kale, cucumbers, beetroots and lettuce. Ripe will also have a full range of pantry essentials including coconut oil, honey, gluten-free products and superfoods. Find the Ripe Food & Craft Market at Zabeel Park in Dubai with extended hours from 9am – 5pm during January and February 2016.